One of the world’s most famous natural attractions, the great arcs of hissing, frothing water crashing over cliffs 20 stories high is a dazzling spectacle. Drifting spray adds to the excitement of being near the edge of a stomach-churning drop. 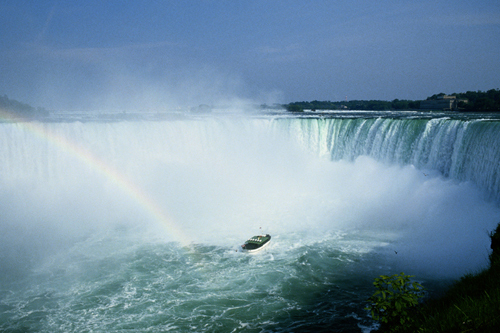 The 173-ft- (53-m-) high Canadian Horseshoe Falls is the mightiest of the three cataracts that make up Niagara Falls. Across the Niagara River is the impressive American Falls, including the smaller Bridal Veil Falls. When visiting the falls, be sure to make time to stop at some of the other sights in the Niagara region, including its renowned vineyards and historic museums. The forces of erosion that created the falls today wear them away. Before hydroelectric stations were built on the Niagara River, the rock face eroded by up to 6 ft (1.8 m) a year. Now it is just 1 ft (30 cm) annually. Almost a fifth of the Earth’s freshwater flows over the falls – so much that it would take only an hour to fill a ditch running between Canada’s east and west coasts. ). The $2 elevator fee includes access to the observation decks. Operating since 1846, first as a border-crossing ferry, now as tour boat, the Maid gets astonishingly close to the falls. 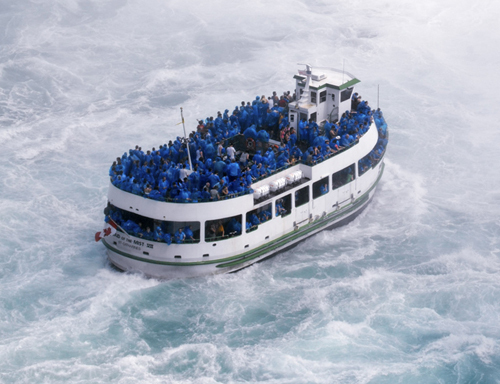 You will be soaked by the end of the 30-minute trip, despite a courtesy raincoat. 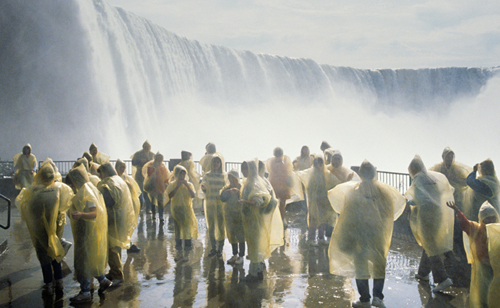 The thrilling journey goes to the American Falls, then to the foot of the Horseshoe Falls. Rock tunnels behind the Horseshoe Falls lead you past a wall of water so thick it blocks out daylight. The vantage point, well below the gorge’s rim, is awe-inspiring. Rain ponchos are provided – and necessary. New York State, on the US side of the international border, lays claim to this cataract, which has a total vertical drop 10 ft (3 m) greater than that of Horseshoe Falls. However, its 950-ft- (290-m-) wide crest and 2-ft (0.6-m) depth sees only a fraction of the volume of water that the Horseshoe Falls carries. It is easily seen from Table Rock. This 2,625-ft- (800-m-) wide, 20-story cataract is formed as 90 percent of the water of the Niagara River, the natural outlet from Lake Erie to Lake Ontario, roars over a semi-circular cliff of the Niagara Escarpment. Water tumbles some 10 ft (3 m) deep at the falls’ center. 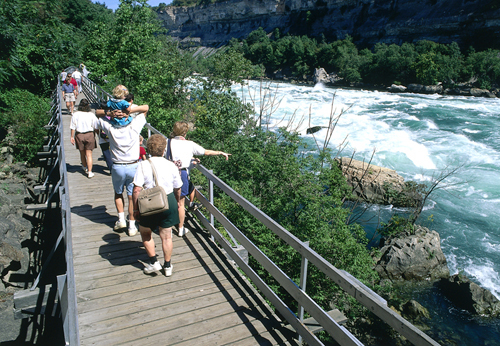 A sharp turn in the river just downstream of the falls creates a raging whirlpool, one of the most lethal stretches of water in North America. 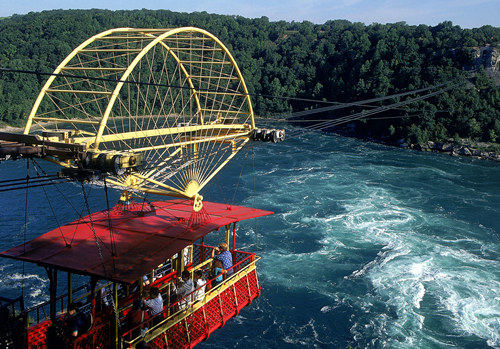 Daredevils can look down on the rapids from the Whirlpool Aero Car, a 1913 cablecar traversing the shores. Stand mere feet from the brink of Horseshoe Falls, a rail the only thing between you and a torrent of water. The lookout point was so named because its surface extended above the gorge like a table leaf. Deemed unstable in 1935, the ledge was blasted off. Stranded on rocks mid-river is this barge, shipwrecked in 1918. The two-man crew survived but had to wait 29 hours near the brink of the falls before being winched to safety. 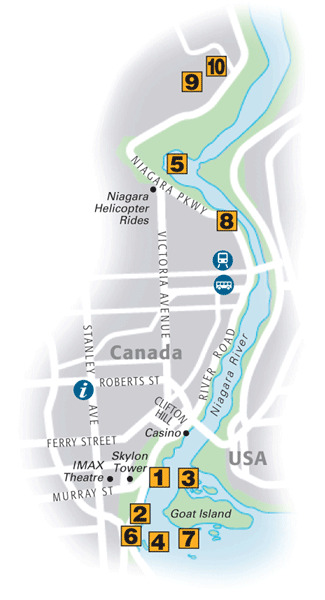 The best view is on an aerial tour (see Niagara Helicopter Tour). Descend from the top of the chasm by elevator to a tunnel leading to a riverside boardwalk. The whirlpools and rapids here are some of the most spectacular, and treacherous, in the world. 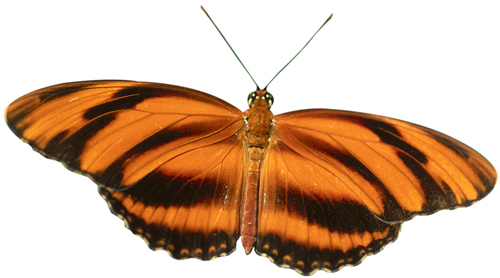 The butterfly conservatory is a huge heated dome with thousands of colorful creatures flitting freely about – and sometimes landing on delighted visitors. These beautiful gardens, located 6 miles (9 km) from the falls, include a splendid rose display that features more than 2,000 varieties.